Available to delivery without package which is space-saving and money-saving. 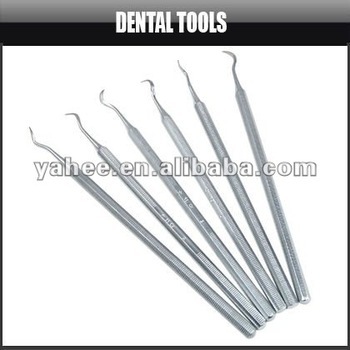 6 piece dental pick set. This set is ideal all for users, always great to keep a set at home or work. The set features 9 different pick/probe all with own cover and also includes a inspection mirror. Great quality not like the cheap plastic alternatives. This stainless steel dental pick set with free storage pouch. This will keep your tools clean and safe when not in use. They're amazingly handy for all types of fine scraping, cleaning, scribing, and shaping tasks. 6 piece set comes with a variety of tips shaped to get into odd corners, crevices, and other hard to reach areas. Knurled handles. We accept West Union, and TT. Payment must be completed within 3 days after you place an order. If you can't checkout immediately after auction close, please wait for a few minutes and retry. We guarantee to ship out within five to seven days after the confirmation of your payment. (Except Holiday). In order to ensure you receive your order tax free upon import, we will declare small sample order as a 'GIFT' with a lower value. Any import charges or fees are the buyer's responsibility. We are not responsible for any accidents, delays or other issue aroused by the shipping service. For item's safety, insurance is highly recommended. . Please confirm your address. We are not responsible for any wrong or undeliverable addresses. We depend on the reputation from Alibaba and Global Sources to succeed. Therefore, your feedback is extremely important to us. If you appreciate our items and service, please show your opinion. We will be grateful to what you do. Please contact us before leaving any negative feedback. We will work with you to solve any problems. All items must be returned in their original condition, in order to qualify a refund or a replacement. Shipping fee and insurance is not refundable. We share the shipping costs incurred half to half. If you do not receive our reply, please kindly re-send for sometimes our mail servers have errors.